4 Beds: 1 King, 2 Queens, 1 Queen sleeper sofa. sleeps 8 max. Heaven’s Peak is a spacious 3-story, Gold Star caliber mountain retreat designed for high class lounging and sophisticated entertaining with a 30 mile mountain range view. The ultimate in luxurious accommodations with a Grand King Master Suite taking up half of the lower level. 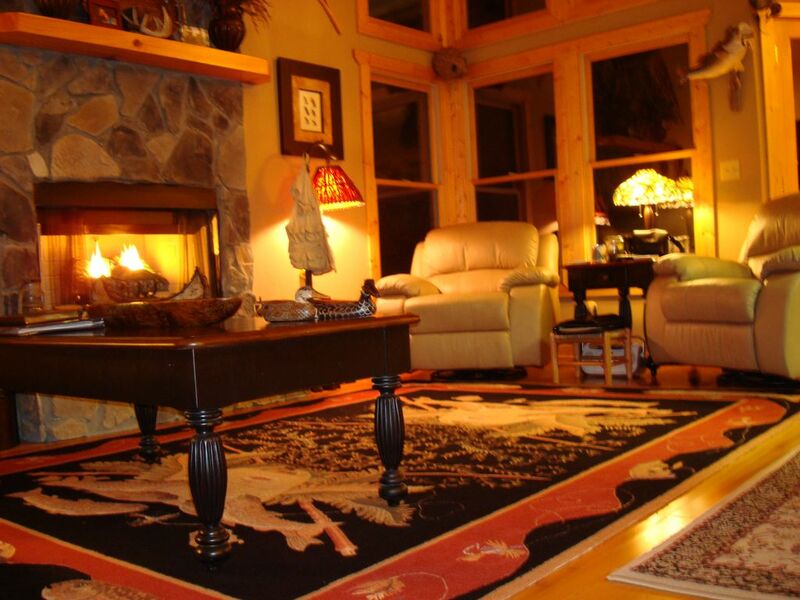 Heavens Peak has all the luxurious touches that make it a Gold Level mountain cabin. The cabin itself is within the beautiful and massive Talking Rock Creek Resort where you can enjoy Resort amenities and natural mountain beauty, just 20 minutes from major towns and only 65 miles from downtown Atlanta, GA! Heavens Peak truly gives you a peek into Heaven! The main level at Heavens Peak is exquisitely furnished and decorated with an Outdoors-man Club motif. Typical comments for the initial entry- 'Wow', 'Ohhh Honey! ', 'OMG!' The soft hide leather couches and leather recliners are comfortable and elegant. The wall of glass frames the giant mountainous view and the rear deck contains 2 dining tables and a huge 6-burner, propane grill for the ultimate in mountain top outdoor dining and lounging. The fully equipped kitchen is stocked with high quality appliances and all the utensils you’ll need for a gourmet meal. Even gourmet spices and condiments are stocked for your use. Completely surrounded with granite counter tops and a bar opening into the dining nook. In the dining nook you’ll find comfortable seating for up to 6-8 with 3 bar stools and a front row view of the mountains. The main level guest bedroom offers a queen size bed and a walk-in closet that houses embroidered bath robes and an abundance of closet space for your wardrobe. Convenient luggage racks are provided as well. The main level bathroom features a granite counter top vanity and a combination shower/tub with upgraded fixtures. The upstairs Master bedroom has a Queen Size bed, wood blinds and an elegant rustic décor ensemble plus a view that is breathtaking. The upstairs bathroom boasts a Jacuzzi jet bathtub, glass-enclosed walk-in shower and a unique custom cherry vanity with granite counter top. Also upstairs is a unique loft peninsula that overlooks the great room and dining nook and has a magnificent view through the tower picture windows below. This loft has a suede and leather sofa that converts into a Queen Size bed. The lower level, The Trout Room, is an entertainment Executive Club lounge features a 32" TV and mini bar refrigerator to keep your refreshments cool. Here you can relax and converse on the genuine leather hide sofa or walk out to the lower level patio deck and dip into the 7-seat, therapeutic hot tub overlooking the blue ridge mountain range. The thick Woven carpet adds to the elegance and coziness of this magnificent lounging space. The Grand-King Master Suite contains a superbly elegant King Size Bed and full bathroom with granite double vanity, glass walk in shower for 'two' and 36” TV. The view from the Grand King Master Suite is extraordinary! Also has Black Out Curtains and down Lights. Built for Gracious Entertaining, Heaven’s Peak offers free extended satellite channel lineups that you can watch on any of the Three big, flat screen TVs throughout the house. Free high speed wireless internet, an abundance of leisure reading material and several entertaining board games. This home has two outside entertainment areas. On the large upper rear deck you can seat 8 at the tables and grill your gourmet delights on the gas grill while gazing out at the incredible view of the mountains. This is where you dine in the Heavens! The lower patio is accessed through the downstairs entertainment lounge. This large patio features a 7-seat therapeutic hot tub and wrought iron table and chairs that sit in front of a wood burning outdoor fireplace. Add 4 gravity recliners...talk about a sweet nap !!! The cabin is easy to get to via paved roads and a flat, double entry, circular drive with 4 extra parking spaces and there are great unpaved hiking roads behind cabin. SIMPLE NIGHTLY RATE PRICE! ONE NIGHTLY RATE FOR GUESTS (up to cabin's maximum occupancy. See pricing notes for details. -3 spacious private bedrooms with King Master Suite on Lower level, 2 private Queen bedrooms Queen sleeper in loft, sleeps 8 guests in comfort. All linens and bedding provided.3 full size luxurious bathrooms, including 2-person shower, jacuzzi jet bathtub. -3, Large, flat screen TV's with Dish Network satellite TV, numerous channel Plus line-up, Free wifi high speed internet, DVD Player in Executive Club Lounge. -7-seat therapeutic hot tub, large gas propane grill, 8 person glass patio furniture, several reclining patio sun chairs, outside wood burning stone firepit, beautiful landscaping and views. -King Master Suite on lower level takes up half of level, with luxurious linens and bedding, 36 inch TV, closet, dressers, large master bathroom with '2-person' glass shower. -Executive Club lounge in basement with 32 inch TV, DVD player and upgraded leather sofa and recliner, woven carpeting and access to heavy duty washer and dryer and small refrigerator! -2 other private Queen bedrooms with walk-in closets, hardwood floors, plush upgraded mattresses, linens and bedding. -Nestled within large gated mountain community with 2 pools, tennis, fishing pond, river access and extreme natural beauty. Adjacent to Carter's Lake. Not far from town but feels like middle of nature. -Conveniently located 30 minutes from major towns of Jasper, Ellijay and Chatsworth, with easy access to 3 major roads, Hwy 411, Hwy 136 and Hwy 53. Close to Carters Lake and Fort Mountain Park attractions. One-time departure cleaning cost is required and is not included in nightly rate. Departure cleaning includes draining and sanitizing hot tub, removing garbage, laundering all the linens and bedding, restocking consumables, cleaning entire home inside and out and preparing for next group. When my wife and I built this second home, we decided that we wanted a mountain top, long range, sunrise view. We wanted to see billions of stars at night, a crystal clear view of the moon, the rolling ridges of Fall's colors below, the explosive painting every morning as God can only paint His sunrises. We got it all, and more! Now, we share it all with you! Go back and read the last paragraph. But, if I were looking for a rental for myself, my family or my best friends, I would want a place that is impressive, exciting to walk into, totally equipped for a high-end retreat; one with great beds, big, fluffy towels, a kitchen with upgraded appliances, utensils, abundant dinnerware and set up for fun, relaxation and romance.... So what is your question? Heaven's Peak was our way of aquiring our little piece of Heaven on earth when we wanted to retreat from it all, totally relax, hear the wind and birds. We wanted to have a luxurious, rustic mountain top home to share with our families, great friends, new ones, clients and sometimes just oursleves! It was built and furnished with all the love and attention to detail we could muster. One year later my love, my soul mate, my all, was taken from all of us in an auto accident. Now, when you mill around Heaven's Peak, you will feel the love and warmth she planted in our 'peak' into Heaven! Trust me!! You will LOVE Heaven’s Peak !!!! Read ANY review, some might touch your heart. Heaven's Peak is located at the top of the higest ridge in the development. You will enjoy the best views of all and the serenity is perfect for a relaxing stay! Talking Rock Creek Resort Community is a gated development with two pools, multiple rec areas, across from Carter's Lake. Top of the mountain, 3 levels have a 30 mile, sunrise view over seven ridges. Sometimes it takes your breath!!! If you’re lucky, a FULL MOON RISING is awesome!!!! See billions of stars at night !! Egyptian cotton and also flannel for those wanting such. Double entry circular drive with additional parking pad on side. Great room on main, 'Man Cave' lower level. Gourmet, loaded kitchen for serious cooks! Two 12 cup Mr Coffee, Two Kuerigs, One French Press; also thermos for outside use. Full size crock pot, mixer, numerous seasonings for your use. Heavy duty silverware, dinner and salad plates, countless glasses and cups. Way overstocked with quality wares! All GE Profile appliance! Kitchen has a three seat bar passthru into the dinning room area. Heavily landscaped, Diadora Firs, Holly bushes, Cedar shrubs, Leyland Cypress and Kockout Roses all around the house. Then there is the massive woodlands everywhere!! Big, can seat seven, six very comfortably. What is provided? The cabin contains all standard kitchenware (pots and pans, dishware, cutlery, glassware, serving ware, utensils), bed and bath linens (sheets, pillows, bedding, blankets, bath towels, hand towels, wash cloths) to support the full occupancy. What should guests bring? Guests should bring their preferred brands of consumables including: Additional dishwashing tabs and kitchen trash bags Additional toilet paper and paper towels Personal deodorants, soaps and shampoos Your clothing, food, beverages and condiments Also consider bringing additional hair dryers, bug repellant, sun screen, flashlights and lighters (strikers) just in case. Firewood if you love an outside firepit. There is a lot of firewood (limbs) found around the area, but bringing split wood is my suggestion. We can arrange for split wood delivered. I’m not sure how to start this review as it all was truly amazing! When it came to finding a home for our work conference we searched for the perfect option nearby the venue- 2400 on The River and we are so glad we found HP. Larry’s attention to detail both as a person and in the cabin is unforgettable. He does whatever it takes to make his guest feel right at home and happy! You could literally ask him anything! We have stayed at many homes/ Airbnb’s in the past and without a doubt this has been our most favorite experience yet! The views from the porch of HP are unforgettable exp. sunrise in the morning. The kitchen was fully stocked with everything we needed to cook and even included two coffee makers! As if that wasn’t enough, there is even a coffee station downstairs as well! Again, all thanks to Larry’s attention to detail! Book this property now if you are looking for a secluded mountain getaway with lots of personal touches, you won’t regret it! Wonderful home, great view and Larry went over and above giving us info and answering all our questions! This started off as a long weekend that turned into a week. So much to be said without over doing it. Ill start with we love Talking Rock Creek Resort! First visit was 6 years ago. Went to ride at Moto Mountain and found there is tons of riding to be done inside the resort itself without going to Moto Mountain. We found Heaven's Peak on Homeaway and contacted the owner Larry via email and he was very prompt in all communication. We loaded up our side by side and 4 wheeler, fishing gear and tennis rackets and had a blast! We were able to hike and ride trails behind and near Larry's home as well as all around the resort. We caught huge crappie at the pond (must have been luck) and even bass in the creek itself. We thoroughly enjoyed the hot tub and firepit as well as the beautiful sunrises at Heavens Peak. We rode over 200 miles that week and found some amazingly beautiful sunset spots as well. If you love nature you will love this resort and Heavens Peak! The amenities were amazing and Larry's attention to every detail made it even more spectacular. We have rented many cabins before but most say that renting from an actual owner via Homeaway and having him genuinely care about your trip means a lot. He wanted to know what he could do to make our stay better. All I could think of was to pay all of our bills and let us stay there free lol! We will surely return soon!!! We enjoyed using the fire pit, grill and hot tub at this cabin. It definitely offers a lot for you to do. The view is beautiful, especially the sunrise. The owner is very hospitable and stays in touch to answer any questions. We definitely had a good time. Restaurants, hiking etc. are a little far from the cabin but that is expected. This family was a treat to have at Heaven's Peak!! They were in touch with questions about local venues and also casually kept me up in how much they were enjoying their "Family Time" together up there. I would love to have them back anytime!! The view was amazing! The cabin was immaculate! Our favorite was the fire pit and hot tub with the view. So relaxing! The owner is very nice and accommodating! These guests were sensational to have. They were actually “almost local” but wanted a Mountain Top Christmas for the Grandchildren; what a neat idea. They are welcomed back anytime!! We had an amazing time at the cabin with our kids & in-laws. Larry was very attentive & responsive to ensure everything went smoothly, even providing detailed information about the cabin (such as location of first aid kit). The drive leading up to the cabin is curvy & steep for the last 10 min but the views are SO worth it!! You literally felt like the mountain belonged to you with no visible neighbors in site & pure peaceful silence. Rocking chairs on the deck were actually recliners - perfect for enjoying the view or reading a book. Kitchen was small but well stocked. Super comfortable mattresses. We ate all our meals outside on the deck, followed by s’mores at the fire pit (kids’ fave). We’ll be back for the views!! Thank you Larry!! This home is located in Talking Rock Creek Resort, a premier mountain resort community in the north Georgia Mountains, one and a half hours from downtown Atlanta, GA and about 25 minutes southeast of Ellijay, GA. The resort community is a secure gated community nestled below Carters Lake and alongside Talking Rock Creek, a premier trout and fly-fishing stream. The resort encompasses over 5,000 acres of secluded mountain territory and is filled with creek front, forest and mountain view homes and sites. With a Rec Center, 2 pools, tennis and basketball courts a Trout Lodge with riverfront access and a large fishing pond, Talking Rock Creek has all the natural amenities within minutes of your property.